Ackerman Security has provided residential and commercial security services and products in Atlanta for over 40 years. Ackerman clients are monitored from their local, company-owned U.L. and CSAA 5 Diamond Certified monitoring center, the only center in Atlanta to have achieved both of these certifications. This means you have the most highly trained professionals responding to your emergency, when seconds count. Security is Ackerman’s only business and with their expertise, they do it better than anyone else. "Cheap" does NOT equal value. If you're not careful, you could end up being robbed twice - once by the burglar and again by a sketchy alarm company that designed a poor system. A 40-year plus track record proves Ackerman delivers superior products and service. Their monthly monitoring fee, starting at just $19.95, is not only incredibly competitive, it's backed by the value of a real security system, and real, responsible human beings protecting your family and assets. PLUS, switch through TrustDale.com and receive 2 months of home monitoring FREE! If you're installing a new system, you'll receive two FREE keyfobs! Ackerman installs only the highest quality products backed by superior warranties and some of the most experienced service technicians in the industry. These are drug tested, criminally background checked employees. Regardless of your needs, give Ackerman a call and allow one of their experts to come work with you to develop an affordable and custom solution. Ackerman's philosophy is that once they shake your hand, they don't ever want to let go! They truly listen to your needs and designed your protection package accordingly. Ackerman's technician stays until the job is done, and they take the time to make certain you are comfortable with the system's management. Plus, Ackerman Security is available to you 24 hours a day, 7 days a week, and your satisfaction is guaranteed - double! 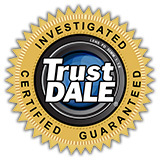 First, with Ackerman Security and as always, when you register with the TrustDale Make It Right Guarantee!